Dr. Victoria Fontan has been spending time in Fallujah since July 2013, one of the only Westerners to do so. She wrote this piece from the ground at the date of publication. 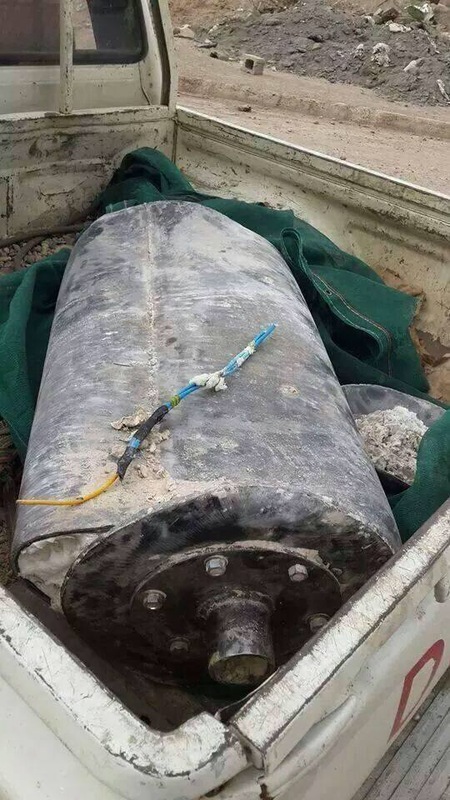 On 21 April, two barrel bombs were dropped from an Iraqi air force MI8 helicopter in the mechanic shops area of Fallujah, close to the government protester demonstration sites. An additional barrel bomb was dropped onto the al-Rashad village near Garma. This is the first such instance of their use in Iraq under the current government, though they have denied their use. Barrel bombs have made themselves known recently with the Syrian government’s assault of Aleppo. These bombs are artisanal; their weight and the amount of their devastation differ according to the circumference of the barrel used. They are filled with incendiary agents, explosives and bolts, and have a devastating effect on the populations on which they are launched. The impact this may have in terms of international law, as well as the ability of the citizens of Fallujah to exercise their newly won political freedoms with barrel bombs landing around the city are critical and diverse. Not only are these bombs destructive, their use against a targeted group may constitute a crime against humanity. Moreover, the international community’s complacence towards the Iraqi government in relation to the population of Fallujah and greater Anbar province may make it an accessory to this crime. International Humanitarian Law (IHL) has made critical advancements for humankind. It regulates the use of weapons in situations of conflict. It presses for rules of engagement to be respected, and for some weapons to be used over others to reduce civilian casualties and suffering. Since it has legalized some forms of killing but not others, International Humanitarian Law has, in its own way, made killing legitimate. Mankind has managed to sanitize the inadmissible, so that states can both assert their sovereignty and exert their monopoly of power over their population. There are certain places in this world where IHL appears not to apply. In the forsaken city of Fallujah, in the Anbar province of Iraq, the Baghdad government has been systematically repressing its own population since January 2013 under the pretext of terrorism, used by Prime Minister Maliki. Not only has the Iraqi government been killing civilians under the narrative of counter-terrorism, but the United Nations Assistance Mission to Iraq (UNAMI), as well as Secretary General Ban Ki Moon, have also seemingly bought into it. The International Crisis Group condemns how both parties ‘endorsed and backed the [Iraqi] government’s struggle against terrorism [while] shunning criticism of its heavy-handed approach’. In the past few years, Fallujah has been emphasized as a stronghold of resistance against the US occupation in Iraq. More than 60% of Fallujah was destroyed in the two sieges of the city in 2004, and, ten years on, it seems to be running the same course. This time, it started with the same Occupy-style demonstrations seen in the US, with Iraqi’s protesting against the central government, perceived to be favoring the Shi’ite population over its Sunni counterpart. As demonstrations progressed, the government tried to block popular dissent on several occasions, culminating in an Iraqi army crackdown of the mainly Sunni populated Anbar province in late December 2013. Since then, scores of civilians have been killed, wounded or displaced and more anti-government sentiment has spread beyond the Anbar province as a result. Contrary to other cities in Anbar, Fallujah was organized against the government from the start. When the Iraqi army began to move into the Anbar province, a Shura, or council was established, comprised of tribes and social groups from the demonstrations in Fallujah. Its mission was to repel, at all costs, government forces. A city known for its unwillingness to surrender, it was not going to fall this time. Prime Minister Maliki had always been very quick to dismiss the Occupy Fallujah demands as mere support for al-Qaeda, even though a closer look at the demonstration showed their clear political undertone. Protesters were demanding an end to talks of federalism in Iraq, no discrimination of one part of the Iraqi population over another, and the resignation of Prime Minister Maliki. As the Maliki government’s troops attempted to enter Fallujah on several occasions in January 2014, the terrorist organization Islamic State in Iraq and Sham (ISIS) also saw an opportunity to assert its power within the region. This came at a time when it was momentarily weak in Syria, and Iraq offered an opportunity to strengthen its influence where it had originated. While the Fallujah Shura originally tolerated ISIS, fearing a similar situation to that of 2004, where foreign agents of al-Qaeda escalated violence there, all outside observers of Maliki’s Anbar campaign exaggerated its influence over the city. These same observers also did not understand ISIS’s clear departure from al-Qaeda strategy, rendering most media reports on Fallujah grossly inaccurate. Al-Qaeda had never taken over Fallujah, and calls in Washington DC ranged between blindly supporting Maliki and a US-intervention in Iraq, could not have been less opportune. As Maliki strengthened his armed repression on Fallujah, claiming not to enter the city to spare the population, he began a relentless shelling of Fallujah in January 2014, from various strategic points surrounding it. It was not long before the Shura made a deal with ISIS to defend its city against a perceived Shi’ite invader. UNAMI never set foot on the demonstration sites and is now failing in its moral mission to monitor the Baghdad government’s actions against its own people. This, even after countless invitations were made on behalf of its leader Sheikh Hamoudi, who was executed by members of the government-friendly group Hamas al-Iraq two weeks before the December 2013 crack down. Since January 2014, countless missiles, mortar rounds and Katiusha rockets have been launched against the civilian population of Fallujah, yet what is happening at present is far more disturbing than anything seen before. An Iraqi air force helicopter pilot, who in the 1980’s also launched chemical agents on the city of Halabja in Iraqi Kurdistan, explained in a conversation with the author: ‘The bombs are still in their developing phase, these two rounds on 23 April were experimental. We are trying to copy what Bashar did in Aleppo, and Fallujah is the perfect place for it.’ None of the bombs launched onto Fallujah detonated; in Garma, the bomb exploded and made a hole five meters wide and three meters deep. It took two more weeks to try to perfect the mechanism, and on 10 May, twenty more barrel bombs were launched onto Fallujah. While many did not detonate, the Iraqi army will no doubt perfect its technology to be even more deadly next time. Barrel bombs are not distinctly mentioned in any international arms convention, they are simply invisible. UNAMI will not likely object to their use, as it is the complacence of its representative Nicolas Mladenov in relation to the Anbar campaign, that has seemingly emboldened Maliki enough to resort to using barrel bombs, among other weapons, with impunity against its own population. Overall, mainstream media has also been silent in relation to the issue, while at the same time condemning Bashar al Assad for the same deeds against his population in Syria. For the moment, barrel bombs can only be seen in blogs around the internet, and on Fallujah-related social media, restricting international attention from this critical development. On 10 May, Fallujah’s infrastructure, alongside its power and water stations, was targeted in the government’s most ferocious reprisal yet. Civilian casualties which have resulted from these attacks between January 2014 and today amount to 40 dead and 60 wounded. Adding insult to injury, 10 mosques have also been destroyed, all Sunni. The perceived Shi’ite war against the Sunni population of Fallujah may well have become a reality due to these extreme acts of violence. Under the circumstances, it could be questioned whether the use of barrel bombs and the indiscriminate use of force against the population of Fallujah constitutes a crime against humanity. According to the Rome Statute of the International Criminal Court, a crime against humanity can be defined as the “[P]ersecution against any identifiable group or collectivity on political, racial, national, ethnic, cultural, religious, gender as defined in paragraph 3, or other grounds that are universally recognized as impermissible under international law.” If, in fact, Sunnis in Fallujah are being specifically targeted by the government, then this could be interpreted as a crime against humanity. If anyone, entity or government, assists in the political persecution of a group of people, would this not make them accessory to this crime? The UN’s support of Nuri al-Maliki, the US government’s impending renting of F16 airplanes to the Iraqi government, the international media’s hate speech against the people of Fallujah: in a perfect world, this could all be prosecuted. [xxiv] Yet while International Law and International Humanitarian Law are meant to be universal, they appear to neglect the people of Fallujah. Telephone conversation with an Iraqi air force officer 27 April and 10 May 2014. The name is being withheld as they are not authorized to speak on the matter. See BBC News, ‘Syria conflict: Barrel-bombed Aleppo ‘living in fear” 28 April 2014 athttp://www.bbc.co.uk/news/world-middle-east-27180006 and http://brown-moses.blogspot.de/2013/12/syrias-barrel-bomb-technology-relative.html, accessed on 12 May 2014. See Group, I. C. (2014). Iraq: Fallujah’s Faustian Bargain. Middle East Report. Headquarters. Brussels, International Crisis Group. 150. Fontan, V. (2006). ‘Polarization between occupier and occupied in Post-Saddam Iraq: humiliation and the formation of political violence’, Terrorism and Political Violence, 18(2): 217-238. Fontan, V. (Forthcoming in 2014). Out beyond Occupy Fallujah and the Islamic State in Iraq and Sham, there is a field. Researching Terrorism, Peace and Conflict Studies: Interaction, Synthesis and Opposition. H. Toros and Y. Tellidis. London, Routledge. Group, I. C. (2014). Iraq: Fallujah’s Faustian Bargain. Middle East Report. Headquarters. Brussels, International Crisis Group. 150. See http://www.counterpunch.org/2013/07/24/occupy-fallujah/, retrieved on 12 May 2014. See http://www.aljazeera.com/news/middleeast/2014/01/iraq-government-loses-control-fallujah-20141414625597514.html, accessed on 12 May 2014. Caillet, R. (2013). The Islamic State: Leaving al-Qaeda Behind. Canergie Endowment for International Peace. On 1 December 2013, militant group Hamas al-Iraq claimed responsibility for the murder of Sheikh Hamoudi online. On the assassination and Hamas al-Iraq’s relationship with the Maliki government, see http://paxinnuce.com/2013/12/09/sheikh-al-hamoudi-and-the-right-to-peace/, accessed on 12 May 2014; on the Occupy Fallujah invitation of UNAMI, see Fontan, V. (Forthcoming in 2014). Out beyond Occupy Fallujah and the Islamic State in Iraq and Sham, there is a field. Researching Terrorism, Peace and Conflict Studies: Interaction, Synthesis and Opposition. H. Toros and Y. Tellidis. London, Routledge. Telephone and Viber conversations with Fallujah residents, names withheld, between January 2014 and now. Ibid. On the Halabja chemical attack, see: http://news.bbc.co.uk/onthisday/hi/dates/stories/march/16/newsid_4304000/4304853.stm, accessed on 12 May 2014. See http://www.aljazeera.com/news/middleeast/2014/05/iraq-army-using-barrel-bombs-fallujah-2014511134023608197.html, accessed on 12 May 2014, the article says ‘alleged’ use of Barrel Bombs since it has not been confirmed by any Human Rights organization, however Fallujah residents testimonies concur, as well as that of Mohammed F. Iraqi Air force pilot. The allegation has since been corroborated by eyewitness reports and the helicopter pilot. The Convention on Prohibitions or Restrictions on the use of Certain Conventional Weapons does not mention Barrel bombs, yet it bans the use of incendiary weapons. Iraq, however, is not a signatory to this particular convention, hence cannot be held accountable for its use of barrel bombs as an incendiary weapon. See: http://www.icrc.org/ihl.nsf/INTRO/500?OpenDocument, accessed on 12 May 2014. See http://www.washingtonpost.com/opinions/american-can-stop-the-barrel-bombs-in-syria/2014/05/07/f3a24554-d498-11e3-95d3-3bcd77cd4e11_story.html, or http://www.bbc.co.uk/news/world-middle-east-27180006, both accessed on 12 May 2014. See http://www.r4biaplatform.com/content/news-story/iraq-army-used-barrel-bombs-fallujah-chieftain, or http://brown-moses.blogspot.de/2014/05/is-iraqi-air-force-using-improvised.html, accessed on 12May 2014. See http://www.preventgenocide.org/law/icc/statute/part-a.htm, accessed on 12 May 2014. See http://complex.foreignpolicy.com/posts/2014/05/08/exclusive_iraq_in_a_major_shift_might_want_some_us_troops_back?utm_source=Sailthru&utm_medium=email&utm_term=%2AMorning%20Brief&utm_campaign=MB%200509, accessed on 12 May 2014. Fontan, V. (2006). “Polarization between occupier and occupied in Post-Saddam Iraq: humiliation and the formation of political violence.” Terrorism and Political Violence 18(2): 217-238. Pingback: Barrel bombs in Fallujah – A Crime Against Humanity? Pingback: Somalia Nation :: Somali Language | US and genocide: Who gets bombed, who gets saved?